If I told you Noah was meeting the standard as a writer, what would you really know about his work? Describing our young writers with a number or using words such as “approaching the standard,” “proficient,” “struggling,” doesn’t tell the story of the writer. It doesn’t tell you Noah likes to write humorous stories. It doesn’t tell you he chooses a variety of structures to organize his writing. It doesn’t tell you he chooses interesting vocabulary or often uses the language he has heard during read aloud or read in books. It doesn’t tell you he is working to learn to stick with his point and strengthen his endings. It doesn’t tell you he can’t wait for his time to write each day. We learn so much sitting beside writers as they work in our workshops each day. Two years ago I gave up my spiral notebook I used to keep records of writing conference conversations for a digital system. Saying goodbye to my spiral notebook with tabbed sections for each student was easier than I anticipated. The time was right. More and more often I found myself wanting to do more than record handwritten snippets of evidence, thought, and conversation. More and more I found myself wanting to take pictures of student work or record student voices. More and more I found myself wanting to link to digital pieces students were creating. More and more I seemed to have a device in my hand instead of a pen. After learning about Evernote I decided to see if I could use it as a tool to record notes from across the day. I found myself enjoying the seamlessness of Evernote. 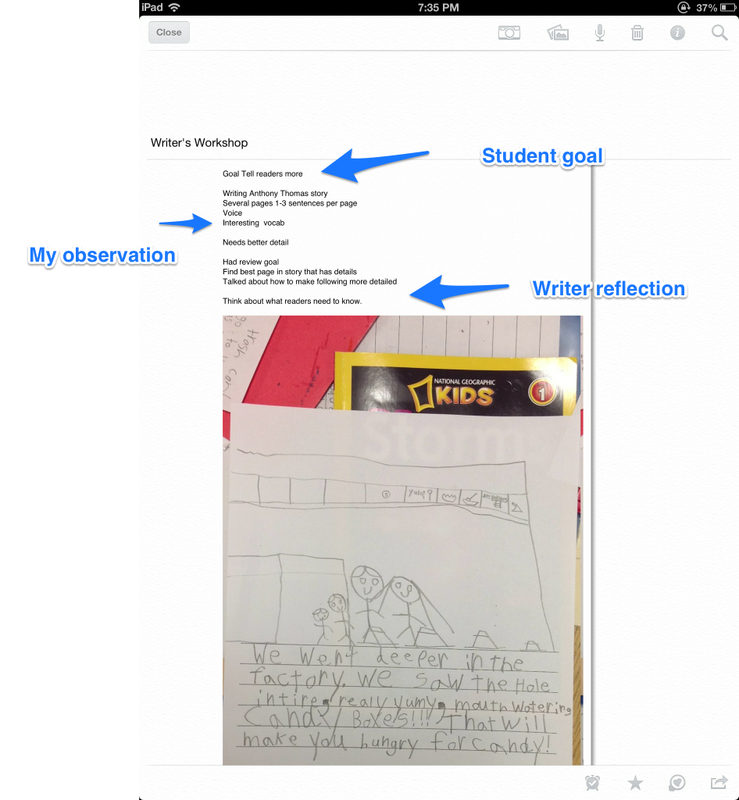 It seemed Evernote was a tool to allow me to capture the learning journeys of the young writers in my classroom. Review Previous Notes: Evernote allows me to view several beginning sentences from the last 6-9 notes I have taken. I try to keep teaching points at the top of the note so I can quickly find them as I begin to confer with a writer. This keeps me focused on the writer from conference to conference and deters me from teaching to a piece a writing. Listen to the Writer: After reviewing the last 2-3 conversations, I create a new page for the student’s notebook. I give the note a title (usually the workshop name and focus of the conversation). Writers begin the conversation by sharing the piece they are currently working on with me. They lead the conversation often sharing what’s working, what they are trying, and/or something they’re trying to work out in their writing. Reflect: During this time I record key snippets of the conversation and reflect to choose a teaching point. Students often take me back into their writing to places where they are trying new crafting techniques or working toward a goal. There is a lot of to consider as I reflect: writer’s history, class focus conversations, the writer’s personality and confidence, goals set by the writer, etc. Teach: Many times students really lead our conversation to the teaching point. Sometimes it is a self-selected goal that becomes our teaching conversation. Sometimes it is something that might be helpful in next steps. Sometimes it is useful to name something they are doing well. I always record the teaching point at the top of the note so I can view it the next time we have a conference. This is often when I take a second to tag the note with keywords so I can me return to the note in a search. Plan: Before I leave, writers share their next step with me. I want to know what they’ve taken from the conversation. Usually this matches very closely to our teaching point. I make sure this is noted in Evernote. Consistency: Keeping the focus of instruction at the top of each note allows me to follow conversations across time. Create a story of learning: Having this digital record across time captures the story of the writer. Collecting conversations over time helps to, not only know the writer, but to share a writer’s growth with parents or educational support teams. Pictures: Sometimes a picture is worth a thousand words. Evernote allows me to take pictures of the writing students are working on during the workshop. Often I take pictures of finished stories, next steps, interesting crafting techniques and celebrations to include alongside notes from a conference. Audio: The audio feature allows me to record entire conferences, students reading stories, plans for pieces of writing and much more. Young writers often have strong oral language, but work to transfer their stories to paper. For these children, recording the story as it is told often supports future conversations if I return to help them to remember what is next, hear interesting vocabulary, or recall details for writing. Organization: This is my favorite part of Evernote. No papers. No spiral. No stacks. I am able to keep everything organized in notebooks and carry it home in my purse! Tagging: Tagging is difficult, but as I’ve worked with Evernote I’ve found tagging to make recording and planning more efficient. Tagging helps me to keep organized. By tagging notes I can find them effortlessly in a search. Sorting: The use of stacks, notebooks, and tagging allows me to sort notes for tracking learning and planning. I can readily pull up all notes about a particular topic or find several notes from a particular student. Legibility: I must admit, reading my typed notes is much easier than the scratched notes I used to write on the run! The best system for record keeping is one you can manage. There are many options available, but for me the flexibility Evernote allows has been helpful. I’m not tied to formats or forms created by someone else. If you’re thinking of going digital Evernote is one tool to consider. Evernote works on many different devices. If you plan to get started I recommend setting up on a computer and then moving to any device. You’ll find help getting started at Evernote: Capturing Learning Journeys. Cathy Mere spends her days learning alongside first graders in Hilliard, Ohio. She slices and dabbles in poetry at Merely Day by Day and joins the professional conversation about literacy, technology and education at Reflect and Refine: Building a Learning Community. I just got evernote this summer and have been using for my life. Just went through Writers Workshop training and heard about Confer. Sadly I do not have any apple products so I can’t use it on my droid or my galaxy tab. So glad to have found this tutorial. I was also wondering if you purchased the premium version. I have not seen this stacks feature, nor have I been able to figure out how to add a note to a note. Stacks are easier to figure out on your computer. I don’t believe they are a premium feature. I worked for well over a year before purchasing premium. Now I take so many photos, I find premium to be worth the money. I am not sure what you mean by add a note to a note. Perhaps you can tell me more. I just got my classlist and am building my student notebooks. 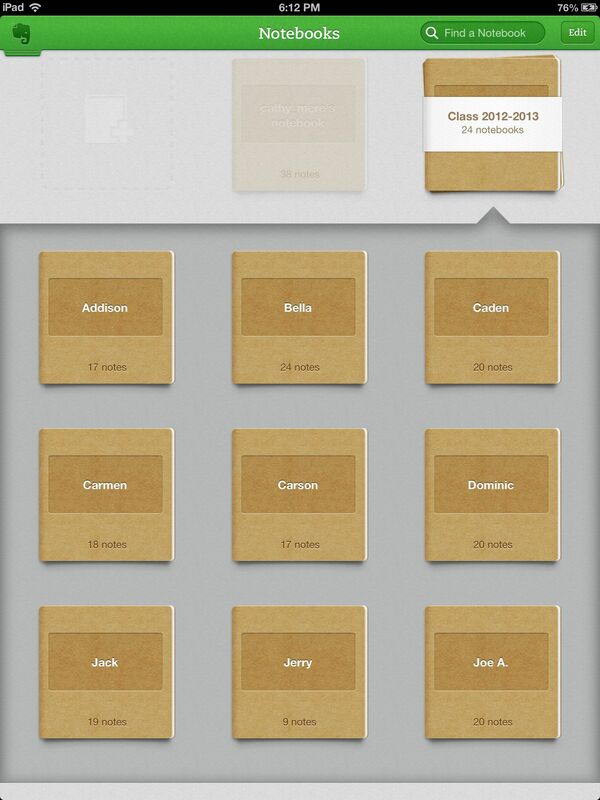 I am trying to figure out kustomnote so I can have “conference forms” premade in each student’s notebook. Any experience with that? Thanks for detailing all the advantages of Evernote. I’ve been considering switching, but don’t type as fast as I can write. Do you have a bluetooth keyboard, or do you use the keyboard on the screen? I just use the keyboard on the screen as it easier for me to carry around. The iPad can split the keyboard screen which makes it easier for some to type. Of course, a keyboard is another possibility. This post could not have arrived at a more perfect time. I’ve been playing around with Evernote. I still have many questions – but now I will not be up! Thanks, Cathy. Check out last Sunday’s post (8/11/13) that includes some great resources, in the comments section, about customizing templates on Evernote. I am glad you found it helpful, Mary. Cathy, you show such a thorough understanding of how to use assessment for learning. There is a flow to your instruction; Evernote allows you to keep teaching b/c your assessment data is at your fingertips. I was wondering…would you/do you use the same process when conferring with readers? Thank you. My system is much the same in Reader’s Workshop (Math Workshop and content studies). In reading, I sometimes take pictures of the text students refer to in discussion, record audio, and take notes of conversation. I share 75 students with 2 other teachers. We have a notebook for each student and add anecdotal notes and photos of work samples with each other. With 24-7 access, we can add or read notes easily. Very useful. Good to know. I work with the same group of students all day. My husband teaches 8th grade and has 120 students, He was trying to decide whether to use a different notebook for each student or just keep an ongoing note. To begin, he is going to try an ongoing note. This is going to be the year I actually use Evernote in the classroom! I have set up notebooks for the last two years, but the… Do you have the premium version or the free? I am determined to be better about documenting conferences, so this is going to be my key! Thanks for the post! I started with free version and used it for nearly a year. The second year, I started taking more pictures and audio notes. I waited until I consistently started running over my data limit to purchase. I now use a premium account and find it to be worth the money. I started with writing too. It just seemed like a natural place to start. It wasn’t long until I was using it across the day. I’ve already used Evernote for a year, but learn more from Cathy every time she shares. Thank you! I’m always inspired by Cathy! She is incredible. Her students are some very lucky kids. Many thanks to Cathy for inspiring so many people to go electronic with their conferring notes! ….and I learn a lot from Katherine. There are many educators working with EN, and all offer new insights. Thanks for the detailed explanation and examples. I have been wanting to use Evernote more efficiently, and now I know how! I can’t wait to get started! As always, Cathy demonstrates her brilliant writing and thinking here when talking about Evernote. What a great synopsis of the power of this amazing online tool! Thanks, Karen, but I am pretty sure I wouldn’t have figured it out without you and our patio meetings. Been playing with Evernote this summer. Your info helps complete the picture of how I can use in my classroom. Need to explore how to create a stack. I find it works best to create a stack on my computer. I usually must slide two notebooks together to make a stack. Then I can easily add other notebooks. How many students do you conference with per day? Does it take longer to get through the conferences at first? The number of conferences I have each day hasn’t really changed. I still confer with 4-6 students most days. I did find it a little slow at firs, but that quickly changest. My biggest concern when I started was making sure I maintained eye contact and good listening habits while typing. Oh wow! I started using Evernote last year (or perhaps I more accurately could say I experimented with Evernote) but was NOT using all of the features you are using! I really like the “picture” aspect of the system and found that to be very helpful talking to parents and sharing at CSE meetings. I’m going to be a LOT better this year thanks to your suggestions. I need to try the notes inside notebooks system. Last year, I just sorted my notes in 2 week intervals. Thank you for sharing all you have figured out through LOTS of *I suspect* trial and error! It is always a learning experience with EN. Like you, I have just tried to focus on a new aspect and be patient with myself. This year I want to focus more on sharing notes and working collaboratively through EN.